Giada de Laurentiis; Dr. Oz; Prosciutto-Wrapped Prunes and Topricin….what do we all have in common? 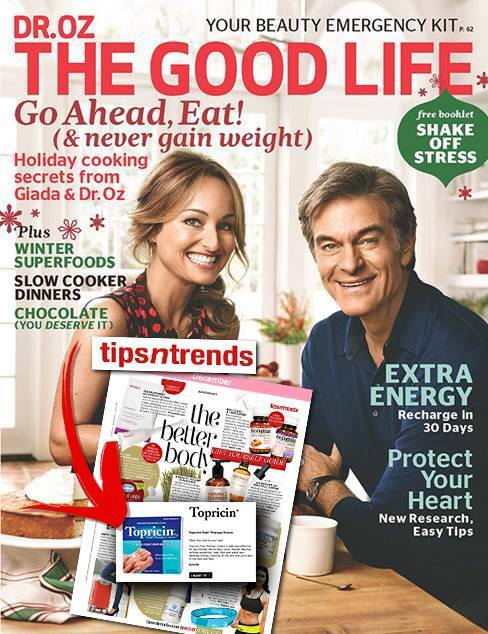 We’re all in the December issue of Dr. Oz The Good Life Magazine, found on newsstands November 24. Find us in the “Gift Yourself Guide – The Better Body!” where we recommend you pop on over to CVS or Walgreens to grab some Topricin Foot Therapy Cream. From swollen ankles while traveling to achy feet from holiday party high-heels – you’ll need it! We all experience pain in our life and that’s when you turn to family and friends to feel better…..and towards Topricin and your doctor if it’s physical pain. Speaking of Doctors, we’ve actually had two members of Team Topricin featured on The Dr. Oz Show. Check-out our Michelle in the video below!